At BrightStar Care in Marietta, owned by David and Louise Evans, our home care agency provides quality home care, caregivers, and medical staffing solutions to families and businesses in Marietta, Cobb, Douglas, and Paulding county areas. We offer compassionate care, peace of mind and exceptional service — any time, any place. Our team is committed to serving all our clients with kind, compassionate professionalism. We will listen carefully to your expectations, follow through on our words, and keep abreast with how your BrightStar Care experiences are progressing. From Lori working in the back office to Louise marketing our products, we are committed to serving our families with first class care and attention. We recognize that life can be stressful for many families when they are trying to coordinate care and support for a family member who needs more help. We are always prepared to take the time and develop plans that will make more things possible for the caregivers, the family, and most importantly the person receiving care. Our local BrightStar Care team is available for you 24 hours a day, 7 days a week with an RN on call to provide the highest level of care and service. Please give us a call today at (678) 290-7827 and we'll be happy to answer your questions. BrightStar Care of GA - Marietta is committed to delivering the highest quality care. We have voluntarily attained accreditation for our home care agency by the Joint Commission which is a nationally recognized quality standards organization with rigorous standards. The creation of BrightStar stems from the desire to create a great company with a great purpose: To provide families and their loved ones with the highest level of accessible home care, dignity, and personal attention they need and deserve. 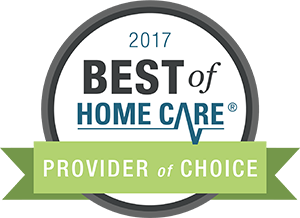 Recipients of this award are best in class for quality in home care. This recognition reassures you that your home care provider is dedicated to your satisfaction and will provide you with quality, trustworthy in-home care. Client Testimonials "We are so pleased with the caregiver you have taking care of Mom, we couldn't ask for anything more." "I really, really, really appreciated all the wealth of information that you passed along." "I was so stressed before I spoke to you and now I am so much more calm and collected." "You have been extremely helpful and I can't thank you enough for the time you spent with my family and I." In-Home Healthcare in Marietta, GA 24/7 BrightStar Care Elder Care Service in Kennesaw, GA Senior Citizens Service in Smyrna, GA Proudly serving Kennesaw, Marietta, Powder Springs, Austell, Mableton, Smyrna in GA.